Le Coq Bleu is your home away from home. It’s a lovely place to meet the Aunt that you never had – Chantal. And a homestay that will blow you away with how dreamy it looks. Have you ever seen a house so beautiful you wish you could go and spend a night in one of its rooms? I have. I’ve seen a lot of wonderful houses in magazines that I could only dream of. There was no way I could ever go check each one out because they’re mostly found outside the country and secondly, they’re homes of celebrities and such. When I first saw a photo of Le Coq Bleu online ( I can’t remember if it was on Facebook or on Airbnb itself when I was browsing through some Baguio accommodation), I was amazed, to say the least. The place looked so beautiful that I knew right then and there I wanted to book it. I booked Le Coq Bleu as a gift for myself on my birthday. Needless to say, I was ecstatic to go spend the night in such a beautiful and dreamy home. By the time Ryk and I arrived at Le Coq Blue, our host, Chantal greeted us. She was really nice. It was my first time meeting someone French and staying in a French home. We met her three friendly dogs – Juno, Hestia, and Zeus. With the approval of Chantal, we brought our little baby boy Noodle (a Boston terrier) with us. He and the three dogs quickly became friends. Hestia thought he was still a puppy and wanted to play with him so much. It was pretty cute watching the dogs play. Beside the loft is a mini living room where Ryk and I could hang out. I took tons of photos of the whole house from there. I took a photo of the dining area and the living room and the stairs and the decors and the loft and just EVERYTHING. Pictures can’t compare to how beautiful the house is. Right then and there, I decided that if I ever make my own house, I’m going to use Le Coq Blue as my inspiration. Needless to say, Ryk loved it, too. What made the house even more amazing was that everything was made from recycled materials! Wow! The cement was the only thing new. It’s such a lovely house. Every corner is filled with delightful stuff. And all these little things work to create what Le Coq Blue is all about – a French homestay. We had such a great time playing with the dogs and chatting with Chantal that we’re planning to book again. Yipee! If you’re planning on booking Le Coq Bleu, here are a few things that you should know. You can only book Le Coq Bleu via Airbnb for 2,200 pesos per night. No walk-ins allowed. Price is good for three persons. Extra persons are charged 500 pesos each. 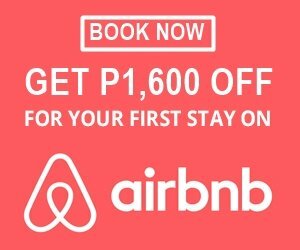 Get ₱1,600 discount on your first trip on Airbnb when you sign up here. Le Coq Bleu is located in Suello Village, Baguio City just 1km from the main highway. From there, Le Coq Bleu is just 10 to 15 minutes away by foot. Option 1: Ride a jeep heading to Greenvalley and stop by Suello Village. Then walk to Le Coq Bleu. You can’t cook in the house or use the refrigerator. The kitchen is OFF limits. However, there’s free European style breakfast served only from 8AM to 10AM. There’s no rice meal. Expect eggs, fruits, pancakes, and bread. Lunch and dinner are also served for a fee. Be sure to let Chantal know one week ahead so she can prepare and so she can send you the menu. But well, there’s also a nearby restaurant, Sunset View Ridge Residences. It’s just two houses near Le Coq Bleu. We definitely recommend the tinapa rice and pork belly with lettuce. It’s so good. We had these for lunch after we checked out. Catch the sunset here. It is really beautiful. Homestay: Le Coq Bleu is a homestay. Not a transient or a hotel. So be sure to know the house rules and which parts are off limits. Upon checking in: Contact Chantal once you book the place and 30 minutes before your check-in time. Curfew: There is a 10PM curfew as the front door is locked at 10PM. Room change: Any room change upon arrival will be charged a cleaning fee of P500 so be sure to inform Chantal of any changes before you check in. On water and electricity: Switch off the lights when not in use. Do not leave your gadgets charging when you are out. Also, water supply comes from a tank since Baguio Water District rations water only three times in one week. Events and Parties: Nope. Not allowed. You come here to relax and enjoy Baguio. Essentials: Towels, bed sheets, soap, and toilet paper are provided during the stay. Dogs: There are three resident dogs in the homestay. If you are a dog lover, this is a paradise. There’s no need to go to some fancy dog cafe. Just book Le Coq Bleu. Aside from Le Coq Bleu, Chantal and her husband also have other Airbnb’s. Like the article? Hover over the images to PIN.